The United Nations has been forced to cut the size of food parcels for those left hungry by Syria's civil war by a fifth because of a shortage of funds from donors, a senior official said on Monday. 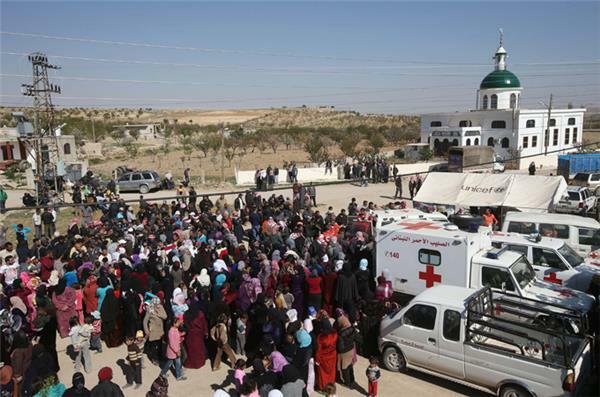 Nevertheless, the United Nations' World Food Programme managed to get food to a record 4.1 million people inside Syria last month, WFP deputy executive director Amir Abdulla told a news conference, just short of its target of 4.2 million. 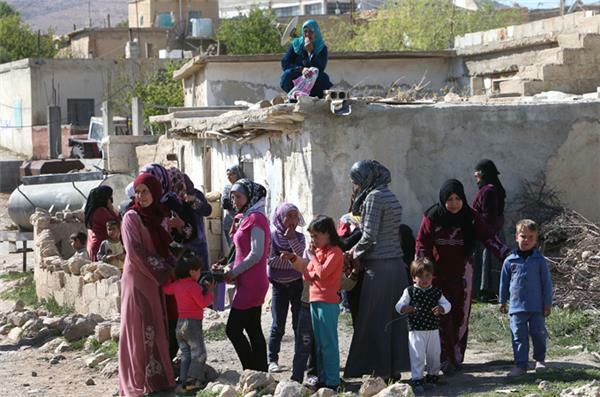 As the humanitarian crisis within Syria intensifies, its neighbours are also groaning under the strain of an exodus of refugees that now totals around 3 million, UN High Commissioner for Refugees Antonio Guterres said. We know that this tragedy, together with the tragedy of the people displaced inside the country, 6.5 million, now shows that almost half of the Syrian population is displaced. Donor countries pledged $2.3bn for aid agencies helping Syria at a conference in Kuwait in January, but only $1.1bn has been received so far, including $250m handed over by Kuwait on Monday, UN officials said. Guterres's office needs more than $1.6bn to fund fully its operations this year in response to the crisis, but has received only 22 percent to date, a UNHCR statement said. 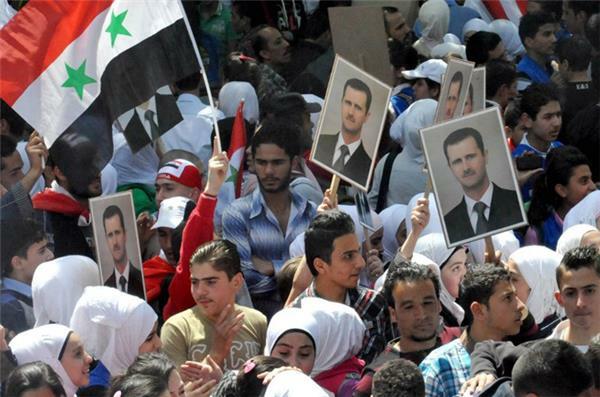 Handout pictures released by the official Syrian Arab News Agency (SANA) shows mainly Syrian youth in a rally in the capital Damascus to mark the 67th anniversary of the establishment of the Baath Party, whose power was entrenched in a 1973 constitution. France said on Tuesday Syrian President Bashar al Assad had a policy to "wipe out" his people in his bid to stamp out a three-year uprising, but this would leave Syria at a total impasse. Assad has forecast that much of the fighting in the Syrian civil war will be over by the end of the year, a former Russian prime minister was quoted on Monday as saying. Responding to those remarks, French Foreign Ministry spokesman Romain Nadal appeared to acknowledge that the international community may have to accept the new status quo. Nadal said. 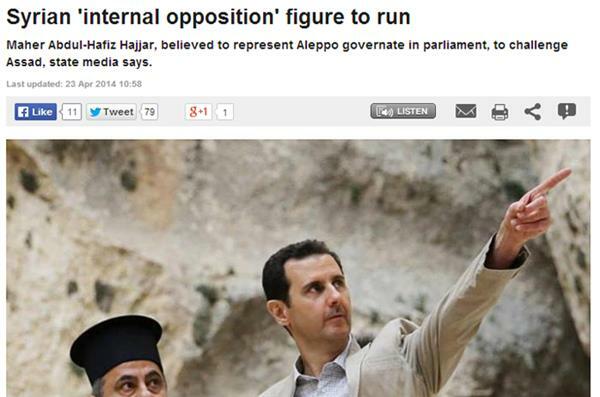 "Maybe he will remain the sole survivor of this policy of mass crimes, but it is a total impasse for Syria." France was was also the first Western power to recognise the opposition National Coalition as the sole representative of the Syrian people. However, Nadal said there was now no other way to reach a solution in Syria other than a proposed peace plan which he admitted was "very slow" in developing. "The only plan of the international community is a political transition. There is no other path. 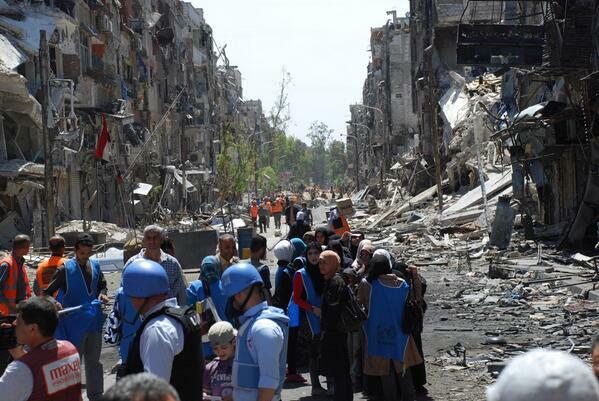 The Geneva process must continue.Military action will only lead to further violence." 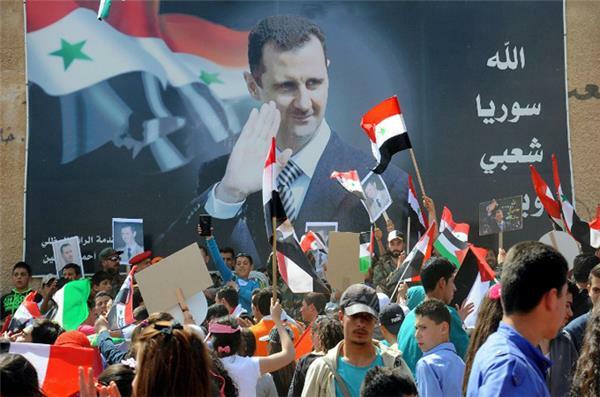 The Syrian government made clear on Tuesday it had no intention of delaying an election that is likely to hand Assad a third term, regardless of war or politics. Human rights violations by Syrian government forces "far outweigh" those by armed opposition groups, UN human rights chief Navi Pillay said on Tuesday, prompting the Syrian UN envoy to accuse her of acting like an irresponsible "lunatic." Pillay briefed the 15-member UN Security Council on the human rights situations in Syria, Central African Republic, South Sudan, Mali and Libya. She again called for the situation in Syria, which has been ravaged by a three-year civil war, to be referred to the International Criminal Court. Pillay said monitors in her office and investigators with the UN commission of inquiry in Syria, led by Paulo Pinheiro, had consistently blamed both parties to the Syrian conflict for human rights violations "but you cannot compare the two." "Clearly the actions of the forces of the government far outweigh the violations (by rebels)," Pillay told reporters. The council has so far been unable to refer Syria to the International Criminal Court because Russia is opposed to the move, diplomats say. 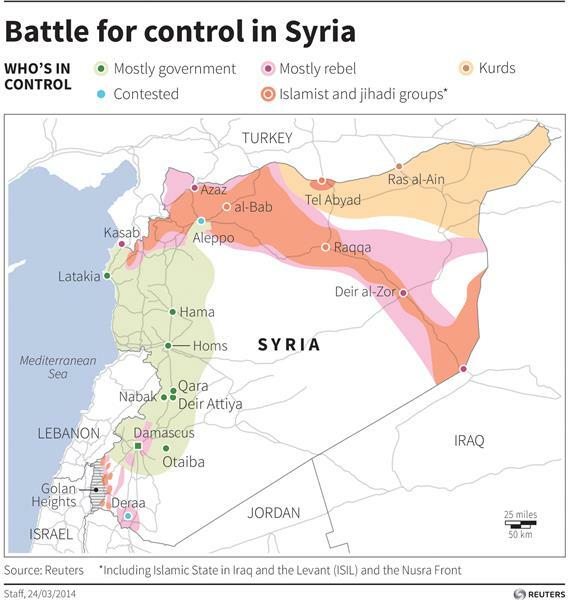 Russia, supported by China, has shielded ally Syria from council action during the civil war. "A drought could put the lives of millions more people at risk," Elisabeth Byrs, spokeswoman for the UN aid agency World Food Programme (WFP), told a news briefing. Syria’s UN envoy Bashar al-Jaafari dismissed UN human rights chief Navy Pillay as "biased", adding that she has become "part of the orchestra" led by some influential members in the Human Rights Council to put pressure on the Syrian government. “The UN High Commissioner ignored the issue of the takfiri groups who committed massacres and crimes against the innocent civilians in Syria and didn’t mention the terrorist acts perpetrated by the armed terrorist groups in Kassab [in the suburbs of Latakia]." His comments come after Pillay on Tuesday blamed most of the crimes perpetrated in Syria on the regime of President Bashar al-Assad. A British man fighting with the Syrian rebels against President Assad has told ITV News that he has "no intention" of coming home to launch attacks against the UK. The transfer of Syria's chemical weapons out of the country under an international accord is back on schedule, a maritime task force in charge of the operation said on Friday. "After a period without loading and retrieval of chemical substances from Syria, the operation is still on schedule," public affairs officer Simen Rudi said in an email. On April 4, "the security situation was considered good enough and eight new containers" were loaded onto Danish cargo ship Ark Futura in Syria's Mediterranean port city of Latakia, Rudi said. Another seven containers were loaded on Thursday. "This means that the operation is still on schedule, but the previously mentioned security situation will influence whether the operation is completed at the estimated time or not," he said. 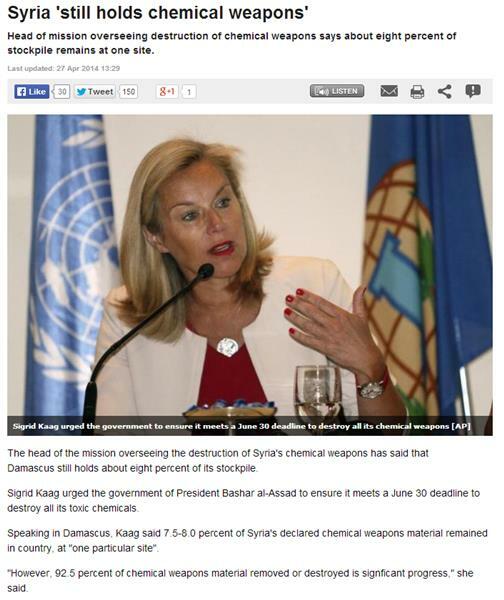 On April 3, an international coordinator told the UN Security Council that Damascus can still meet a June deadline for eliminating its chemical weapons but must resume the stalled transfers. 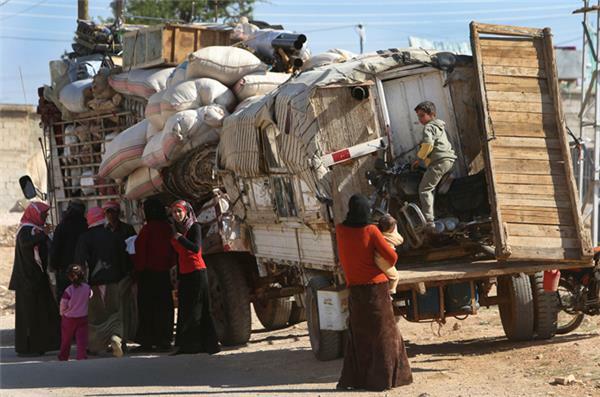 Syria suspended the transfers for what it said were security reasons. Sigrid Kaag, coordinator for the international operation, warned that any new delay would make it "increasingly challenging" to stick to the June 30 deadline, according to diplomats in New York. This video uploaded to Youtube is an interview with Abu Sulayman Al-Muhajir, a member of the shariah committe of the Nusra Front. Speaking in English, the preacher discusses the relationship between the Nusra Front and the Islamic state of Iraq and the Levant and the reasons behind the recent fighting between the rebel groups. Al Jazeera cannot independently verify the content of this video. Activists say shelling and firefights between Syrian government forces and rebels in the northern city of Aleppo have killed at least 28 people. Shelling and firefights between Syrian government forces and rebels in the northern city of Aleppo killed at least 29 people, activists said Sunday. 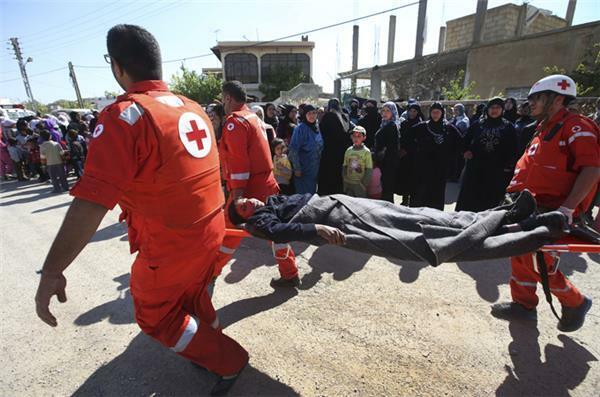 The fighting occurred a day after both sides in Syria's civil war claimed a village near Damascus fell victim to a poison gas attack. The Britain-based Observatory for Human Rights said that at least 16 rebels were among those who died in the overnight combat with President Bashar al-Assad's forces. 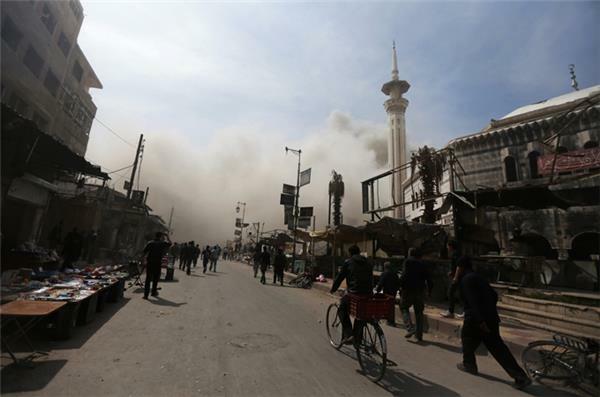 At least 13 civilians were also killed when government aircraft dropped barrel bombs on the city's three rebel-held districts late Saturday, the Observatory said. 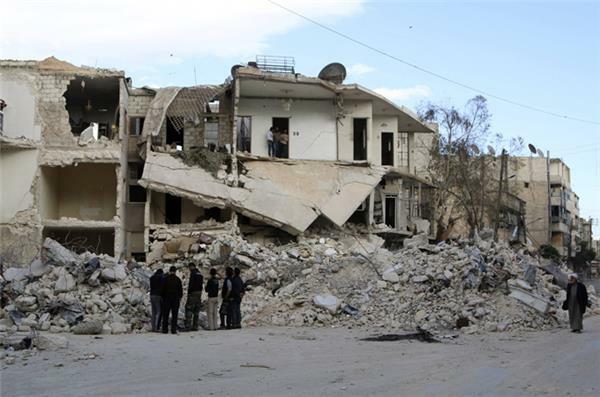 Another activist group, the Syria-based Local Coordination Committees, reported heavy fighting in Aleppo, saying Assad's warplanes launched fresh airstrikes there on Sunday. Both activist groups also reported airstrikes on rebel positions in a village in the oil-rich Deir el-Zour province near the Iraqi border. The Observatory said at least four people were killed and scores were injured in that strike. 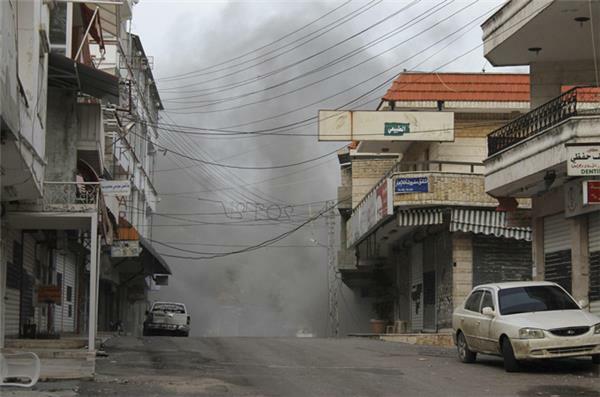 Smoke rises after what activists said was shelling by forces loyal to Syria's President Bashar al-Assad in the town of Kasab. 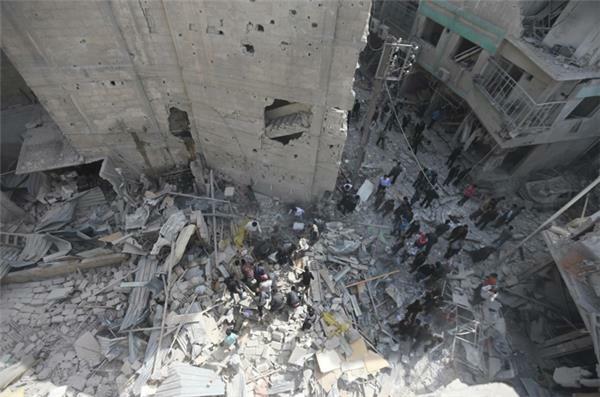 A site hit by what activists said was an attack by the Syrian air force in the Duma neighbourhood of Damascus. This video allegedly shows fighting between government and rebel forces in the Southern area of Aleppo city. This video allegedly shows clashes between rebel and government forces in the rebel-held part of Homs. 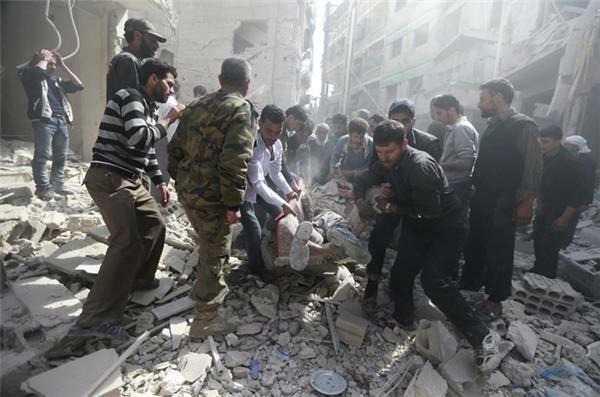 Syrian rescue workers stand on a damaged street following reported air strikes by government forces in the Aleppo district of Ansari, in the southwest of the city. 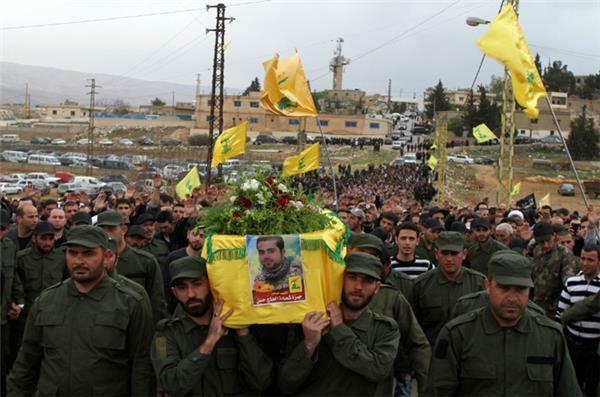 Hezbollah members carry the coffin of Hamza Haj Hassan, a reporter for Hezbollah's al-Manar television who was killed while covering the Syrian army's takeover, on April 14, of the Christian town of Maaloula, during his funeral in his home village in Shaath. Syrian rebels fighting to topple President Bashar al-Assad for the first time received at least 20 US-made TOW anti-tank missiles from a "Western source," a rebel official told AFP news agency Tuesday. "Moderate, well-organised fighters from the Hazm movement have for the first time received more than 20 TOW anti-tank missiles from a Western source," the source said on condition of anonymity, and without specifying who had supplied the rockets. The Hazm movement, part of the opposition Free Syrian Army, brings together mainly ex-army officers and soldiers who defected from the military to join the revolt. "More have been promised should it be proven that the missiles are being used in an effective way," the source said. "Dozens of fighters have been trained with international assistance in the use of these missiles," the rebel said, adding that the weapons have been used in flashpoint areas of Idlib, Aleppo and Latakia provinces in the north. Amateur video distributed by the opposition Masarat media network showed rebels unpacking, loading and firing several missiles at unnamed locations in the Syrian countryside. "Most of the targets were tanks," said the rebel official, adding that "the 20 missiles have been used 100 percent effectively, always hitting their targets." Vastly outgunned by the army, rebels have frequently called on the West to provide them with specialised weaponry. 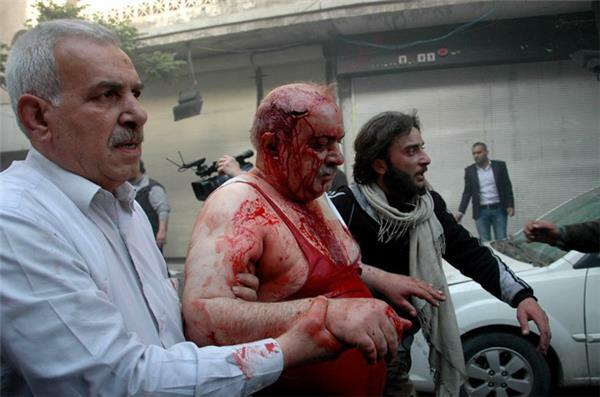 "The international community needs to help stop Assad's army and Iran. We are calling for anti-aircraft weapons to be shipped over," opposition National Coalition member Louay Muqdad told AFP Tuesday. France has said it will table a proposal before the United Nations Security Council authorising the International Criminal Court to investigate crimes against humanity in Syria, according to France's ambassador to the UN. 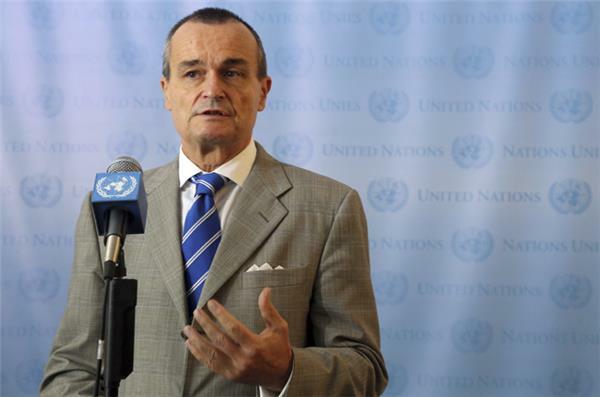 Gerard Araud said on Tuesday that France hoped to introduce the resolution in the next few weeks, after a presentation to council members showed thousands of gruesome photographs of starved and tortured detainees in prisons run by the Syrian regime. "We are going to try to obtain authorisation for the ICC to act," Araud said. "We now have proof," he added. Activists say that Syrian airstrikes have killed at least four people in the town of Zabadani, one of the last rebel-held towns on the Lebanese border. Activist Ammar al-Hassan says the strike occurred early on Wednesday, Associated Press reported. He says shelling also had increased on the town lying in the rugged hills of the Qalamoun region. 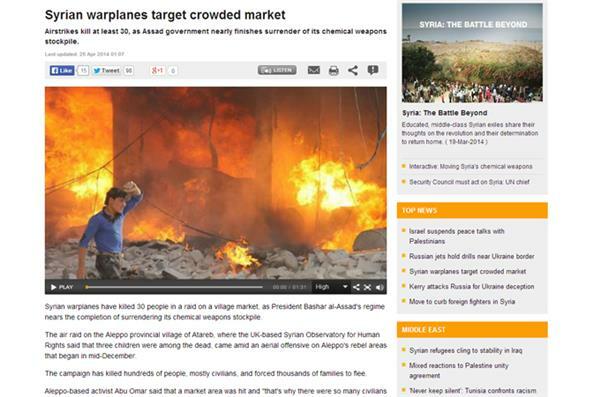 The Britain-based Syrian Observatory for Human Rights also reported on the strikes. Jordan's airforce hit and destroyed military vehicles trying to cross from Syria, Jordanian state television said on Wednesday. 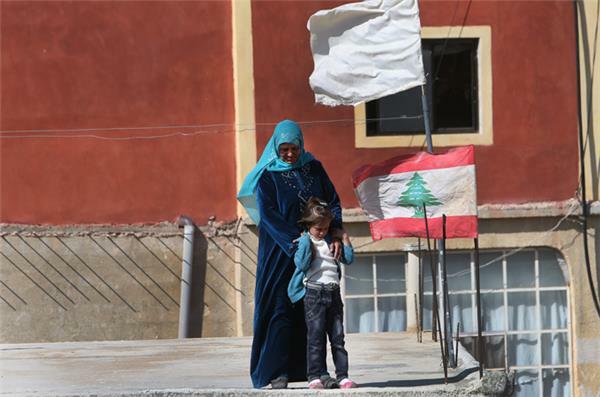 A Lebanese convoy of soldiers, clerics and Red Cross officials have delivered aid to a remote village near the Syrian border. 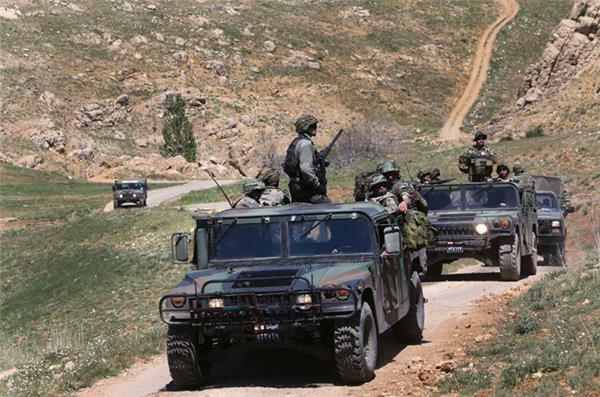 The border hamlet of Tfail was bombed by Syrian government aircraft and blocked by Lebanese fighters. 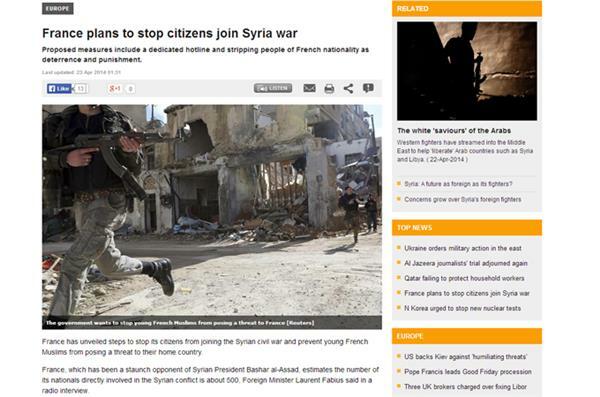 France has unveiled steps to stop its citizens from joining the Syrian civil war and prevent young French Muslims from posing a threat to their home country. 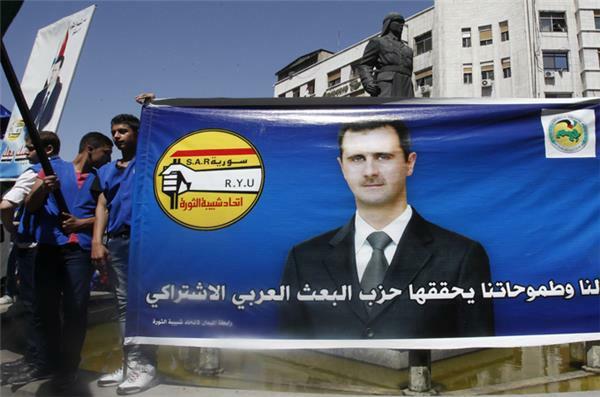 Syrian state media has reported a member of the People's Assembly has registered as a challenger to Bashar al-Assad in the upcoming presidential election. 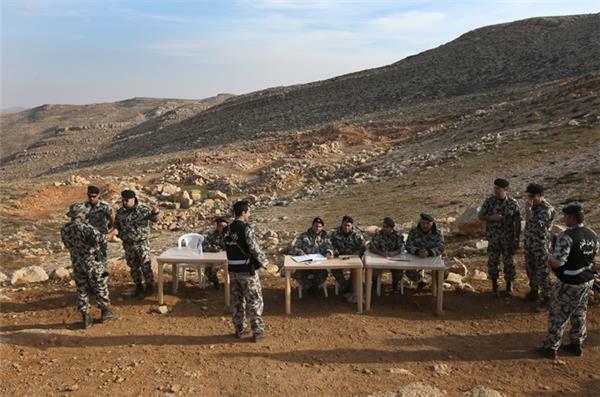 The Syrian opposition in exile has criticised the planned election of June 3 as a "farce", while the UN and the Arab League have said it poses a major obstacle to efforts for a negotiated peace. To read Al Jazeera's full story, click here. More than 30 people have died in the Syrian village of Alatarb, north of Aleppo, after government jets bombed a crowded market. Syrian warplanes have killed 30 people in a raid on a village market, as President Bashar al-Assad's regime nears the completion of surrendering its chemical weapons stockpile. China's foreign ministry said that it did not believe that the country's biggest arms maker had violated any international conventions, after a canister bearing its name was shown in footage believed to document a gas attack in Syria. Attacks this month in several areas in Syria share characteristics that have led analysts to believe that there is a coordinated chlorine bomb campaign, with growing evidence that it is the government side using chemical weapons. 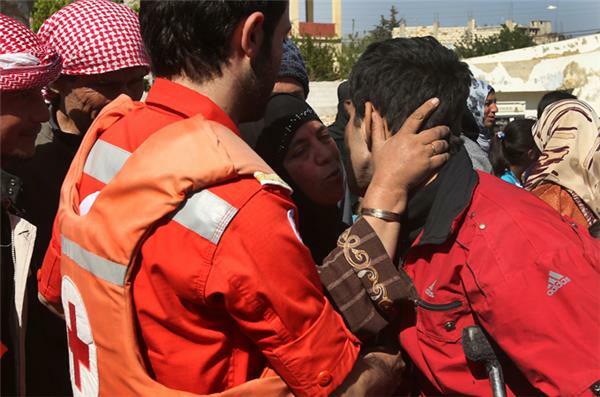 In the rebel-held village of Kfar Zeita in the central province of Hama, 200km north of Damascus,opposition activists uploaded video of people choking and being fed oxygen following what they said were bombs dropped from helicopters on April 11 and 12. Further unverified footage showed a partially exploded canister with the chemical symbol for chlorine along with the name of Chinese arms manufacturer Norinco. 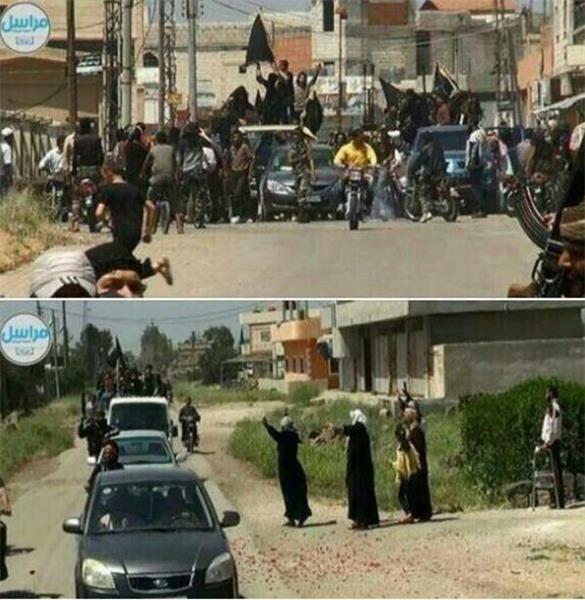 Clashes between ISIL and Kurdish fighters. The Syrian Observatory for Human Rights is reporting deadly clashes between Kurdish groups, including the YPG, and ISIL in the north-eastern town of al-Qahtaniya. 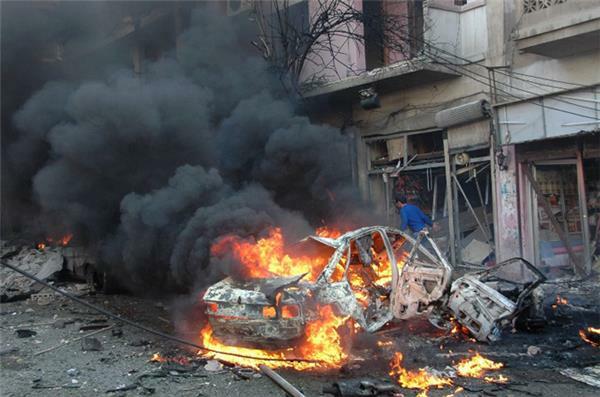 Three member of ISIL are said to have been killed and a number of YPG members are reported to have been injured. The US Treasury department is alleging hundreds of millions of dollars has flowed from Kuwaiti individuals to Syrian rebel groups such as Jabhat al-Nusra. Read The Washington Post's full story here. Rebel mortar fire on government-held districts of the Syrian city of Aleppo killed at least 21 people and wounded 50 according to a human rights monitoring group. 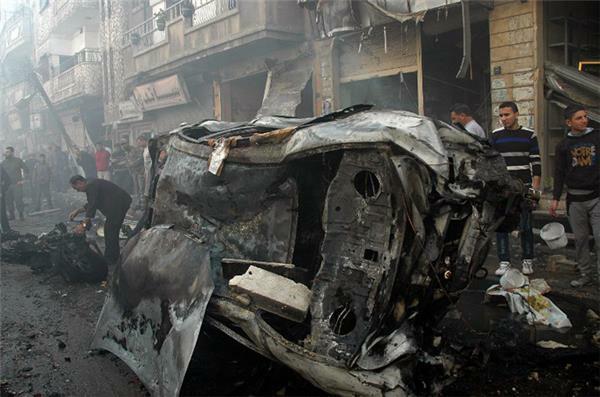 "The fire targeted regime-held neighbourhoods, including some in the Old City where the rebels are trying to advance," the Britain-based Syrian Observatory for Human Rights said on Sunday. Sunday's mortar fire came as "Islamist rebel brigades blew up a building housing the Chamber of Industry in the Old City, which was being used as a headquarters by government forces," the Observatory said. 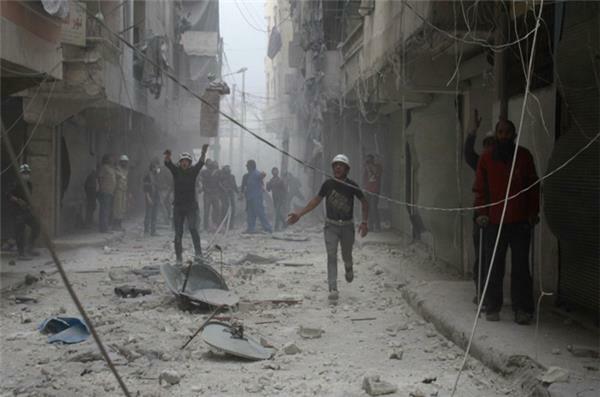 Meanwhile, government aircraft dropped barrel bombs on several opposition-held districts, including Baidine, where six people were killed, the Observatory said. 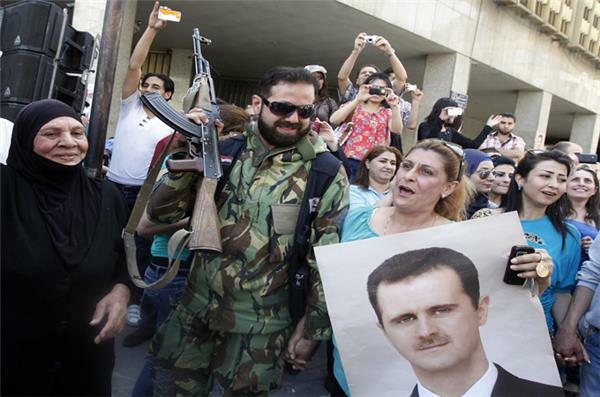 Elsewhere in the country, government troops recaptured a guard post near the town of Samra in Latakia province, the heartland of President Bashar al-Assad's Alawite community, the state SANA news agency said. 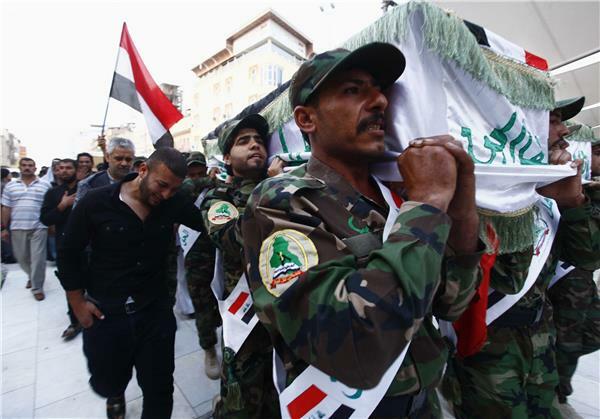 Fighting was continuing inside the town, which opposition fighters captured last month, the Observatory said. Aleppo is divided between government and opposition control, and both rebel bombardments and regime air strikes have intensified in recent weeks. An international rights group called Tuesday for the UN Security Council to block the flow of weapons to Syria's regime, which it said was launching indiscriminate attacks with "barrel bombs". The New York-based Human Rights Watch said it had documented 85 aerial attacks by the regime against opposition areas in northern Aleppo province since February 22 alone. It urged the United Nations to block the flow of arms to the government and any group committing abuses against civilians in the war-torn country where an estimated 150,000 people have been killed in the past three years. The strikes, most reportedly involving "unguided, high-explosive barrel bombs", have hit civilians and civilian objects "indiscriminately". The group said attacks that cannot distinguish between fighters and civilians are "unlawful". 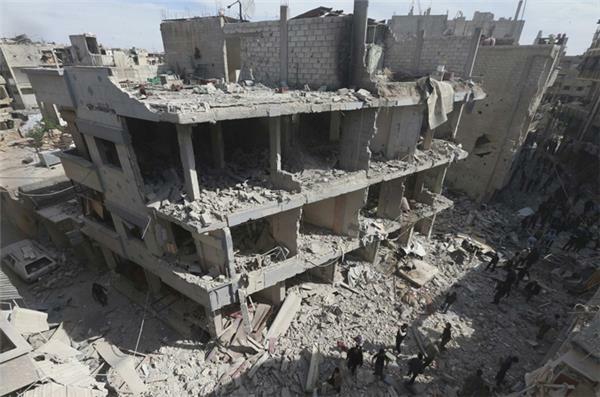 Such attacks "continue despite a United Nations Security Council Resolution unanimously passed on February 22, 2014, demanding that all parties in Syria cease the indiscriminate use of barrel bombs and other weapons in populated areas," HRW said. 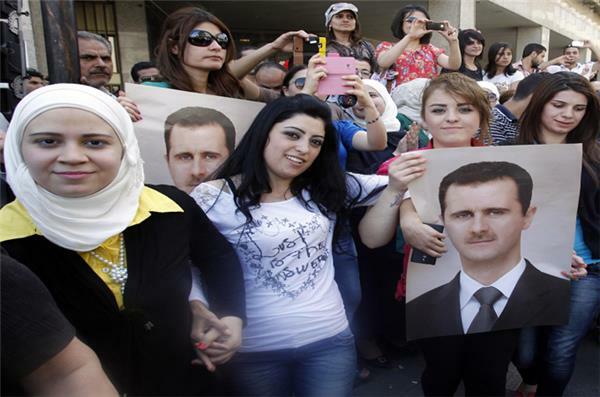 Supporters of Syrian President Bashar al-Assad celebrate after he formally submitted his nomination to seek re-election in June, in Damascus.